Each section of this large river is unique in its structure, habitat, and species. 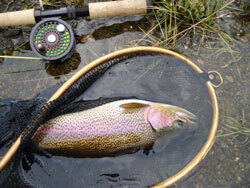 The following area descriptions offer a glimpse of what is available for the fly fisher. 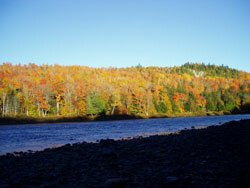 One of the Kennebec's scenic and depending on location, more remote sections. Because of power generation, flow schedules here fluctuate daily. The majority of the trips take place early in the morning or late afternoon through evening. Though, again, depending on releases and flows from tributaries, wading can take place all day. We target landlocked salmon and brook trout here. 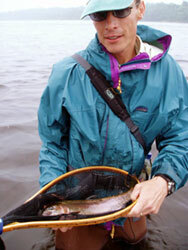 Though, occasionally, a rainbow or brown trout can be caught. Wade trips here can be mild to difficult, roadside to arduous undertakings. The hiking to some of the areas can be just as rewarding as the fishing. Having the mindset to cover water well and to move often either on foot or vehicle can provide the physically fit fly fisher much more opportunity to cover new water. This is a fun and demanding way to fish and not for everyone. It is also not the only option here. Autumn here is a beautiful and quiet time. With salmon and brook trout preparing for spawning, it can be the place to be in September and October. Fall foliage in The Forks, Maine. April through early July and then again September through October. 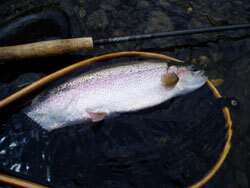 Both full and half day wading trips are offered. Full day float trips are available depending on flow schedules and volume. Water releases from Wyman Dam are much cooler than any of the other tail waters on the Kennebec. Water temperatures and the geography of the river combine to make this one of Maine’s most valuable and unique tail waters. Though flow rates do fluctuate, they are not of the extremes of the Forks section. A wild population of rainbow trout is the main attraction of this part of the river. Landlocked salmon and brook trout also inhabit the tail water. Rainbow trout caught in Bingham, Maine. 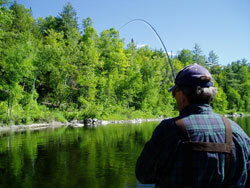 their skills here while beginner anglers can learn much from the area. Wade trips available for both full and half days. Float trips available for full day only. river itself. Mayflies, caddis, stoneflies, and other food sources can all be on the water simultaneously. Late May until early July and then again September through October. Full and half day float trips are available. Wade trips are not offered for this section. 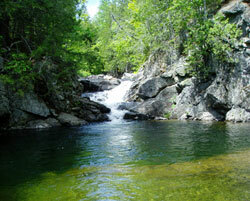 Maine’s riches tail waters in aquatic life. This section has something for every skill level, whether a complete novice or a seasoned veteran. Mid May through early July and then mid-September through early November. Wade trips available both half and full days. Drift boat trips are not offered for this section. 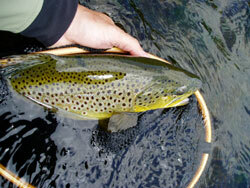 brown trout thrive here and continue to amaze us with their growth rate. This section can produce some of the best (and most frustrating) dry fly fishing of the year. Hatches start in mid May and continue throughout the season. Mid-May through early July then late September through early November. Wade trips available for either full or half days. Float rips available also either full or half days. 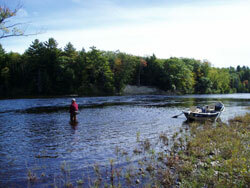 Landlocked salmon, brook trout, rainbow trout and the occasional brown trout are all in residence here. This river does have fluctuating flows on certain dates, so planning ahead is crucial to prime fishing. water. Again, like some other waters, this can be roadside or fairly rugged so there is something for everyone. April through early July and September until the end of October. Full and half day wade trips. No float trips are offered. 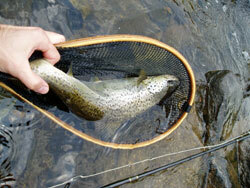 Fishing for trout in a small stream setting is for us one of fly fishing’s greater challenges. Technical casts and delicate presentations, all while sight fishing, contribute to the demanding nature of these waters. We have at our disposal numerous waters to fish within close proximity of each other. Having that much water to choose from gives us the option of fishing one to three streams in a day. Due to the size of these smaller waters, a one to one ratio is suggested as the most productive and enjoyable option. Memorable locations, jewel like fish, dry flies and smaller rods (2-4 weight) all combine to make this a lasting experience. Both half and full day wade trips are available. © 2006 Kingfisher River Guides. All images are property of Kingfisher River Guides and may not be used or reproduced without explicit permission. Page last updated on 04/17/2006. Site design by MaineWest Business Technology.